A former colleague who I had worked with in Niger in 2010 during the food crisis emailed me to say a photo I’d taken of a little three year old boy, Saguirou, who was recovering from severe malnutrition had been spied on posters for Save the Children’s hunger campaign as far afield as Dessie in Ethiopia and in The Standard newspaper in Nairobi. My thoughts immediately went back to the time I’d met Saguirou and how great it felt to see him and other children like him making a promising recovery. Sadly, Save the Children’s new report ‘A Life Free from Hunger’ shows that rising food prices and a lack of global investment to tackle malnutrition are putting future progress on child mortality at risk. This means that the lives of children like Saguirou are being put in jeopardy. 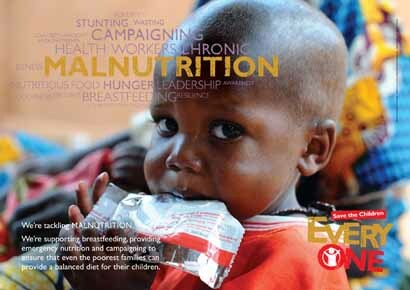 If no concerted action is taken, half a billion children will be physically and mentally stunted over then next 15 years. Children like Saguirou, and all the others I’ve met working in places like Niger, Somalia, Kenya and Ethiopia won’t have the chance to have a future like we expect for our own children. Find out what you can do here.